The March 11 four years ago was the day when a tragedy came to Japan. An Earthquake and a Tsunami occured in Japan, this tragedy destroyed buildings, places and Lives. 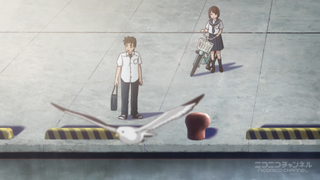 In Memorial of that tragedy Asahi Productions dedicated a Short Anime about the tragedy. The Voice actors Choosen for this Job are: The stage actress and Sendai native Natsu Yasumuro stars with voice actors and Shiogama natives Nobunaga Shimazaki (Ace of Diamond, Free! - Iwatobi Swim Club, Silver Spoon) and Kouichi Yamadera (Ghost in the Shell, Evangelion, Ranma ½). You can watch the short here Wanna watch more Anime? Get a Crunchyroll Premium Membership!